It was the summer of 1954. Barely a year had passed since Watson and Crick had published their double-helical model of DNA structure. A letter was published in Nature that August, by a little-known group of scientists based in Madras, India. The paper proposed a model for the structure of collagen, the most abundant protein in the human body. This structure – a triple helix of amino acid chains wound around each other – would come to be known informally as the ‘Madras’ model, and the scientist proposing it, GN Ramachandran, would go on to create the famous ‘Ramachandran’ plot to understand protein structures, the stuff of textbooks today. Over sixty years after this seminal discovery, another group of Indian researchers have come up with a way to objectively assess the amounts of collagen in injured tissues using a method they call ‘optical biopsy’ and to use the same to monitor wound healing, a finding that may help burn victims throughout the country. An estimated 60-70 lakh Indians suffer burn injuries every year. Nearly 10% of these injuries are severe enough to require hospitalization and almost half of these patients succumb to their injuries. During the treatment of burn injuries, it is crucial to assess the progress of healing in the wounded tissue. This is usually done by monitoring the amount of collagen, the major structural component of the extracellular matrix in our body. The ‘gold standard’ method to achieve this so far has been to perform histopathological analysis on tissue excised from around the burnt area. Unfortunately, this method involves tissue biopsy, which may be painful for the victims, and requires a trained clinician to perform a subjective assessment of the stained and processed tissue sample. Krishna K. Mahato, a physicist by training, entered the field of fluorescence-based diagnostics when he joined Manipal Academy of Higher Education, Manipal, India. He and his team have come up with a way to measure the progress of wound healing by assessing collagen levels using a method called Laser Induced Fluoroscence (LIF). This method, which the researchers validated in both animal models and clinical samples, relies on a property of collagen which allows it to emit light at a certain wavelength when laser light of a different wavelength is shone on it. This emitted light, or ‘fluorescence’, can be measured using a detector and used to estimate the amount of collagen present in the tissue. 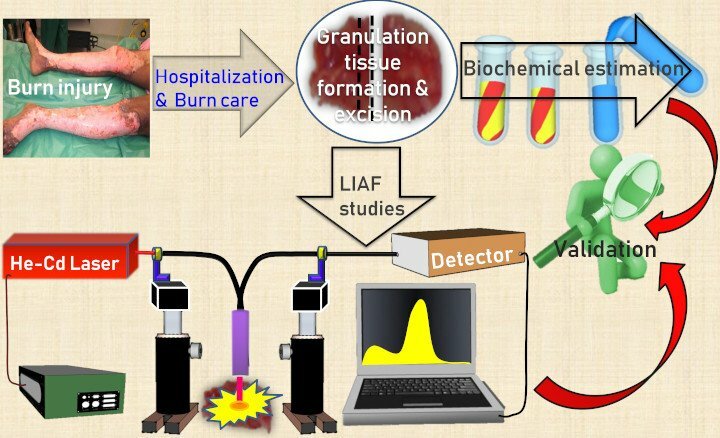 In their most recent study published in The Journal of Biophotonics, the researchers collected tissue biopsy samples from 20 burn wound victims admitted to Kasturba Medical College, Manipal Academy of Higher Education, Manipal, India. For each of these samples, they performed biochemical analysis, as well as Laser Induced Fluoroscence (LIF) measurements. The results from the two methods correlated well. The LIF method adds the benefits of being rapid, only taking 30 seconds to 1 minute per sample for assessment (once set up) and of not requiring highly trained personnel. “Any layman can do the experiment. It is not subjective, it is objective assessment,” said Vijendra Prabhu, the first author of the study. “We found a very good environment here between the scientists, engineers and clinicians,” said Mahato, underlining the importance of such interdisciplinary collaborations. “The good part is that they have correlated it with the biochemistry and that is the strongest point of this paper,” said Asima Pradhan from the Indian Institute of Technology, Kanpur, who was not associated with this study. She suggested that the authors increase the number of samples for future studies and try to move the assessment process in vivo, i.e. eliminate the need for tissue biopsy. This is a future direction the authors expressed interest in as well. 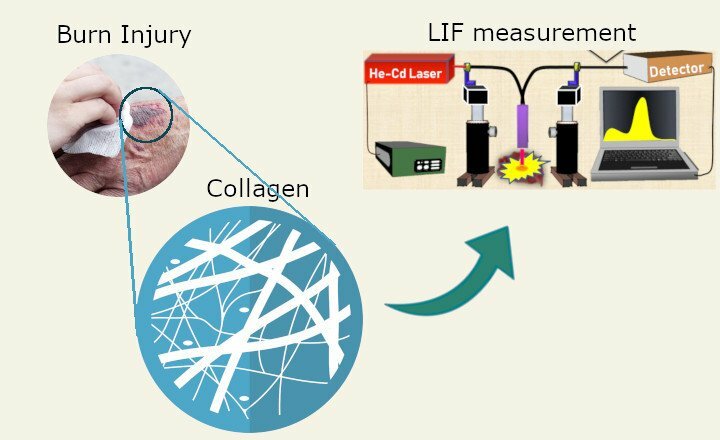 In their preclinical studies, the authors have been able to use LIF to track collagen content and wound healing in vivo by simply implanting an optical fibre in the injured tissue. The researchers are hoping to use this method, which does not require excised tissue, in clinical studies in the future. Please let us know your views on this articles in the comments below.